Ok…We love breakfast around our house. And there is nothing better than a meal that requires you to pour sugar all over the top. Seriously, is there a better way to start the day? Recently, we made a cake and had some extra cream cheese icing left over. We decided to put it to good use and made some cinnamon waffles. 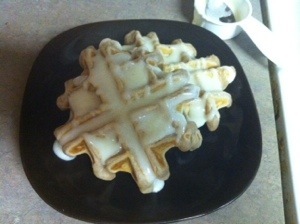 Toss some icing on top and you have a cinnamon roll in waffle form. Whoo Wee! Mix your waffle ingredients in a bowl until well mixed. There will be some lumps, but that is good. Cook waffles in your waffle iron until golden brown. 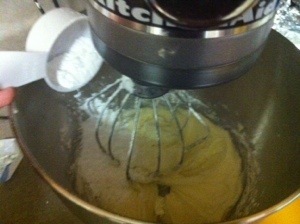 Mix all the ingredients on low until you get a creamy mixture. I like mine a little runny for the waffles, just add the milk slowly. You can always add more!